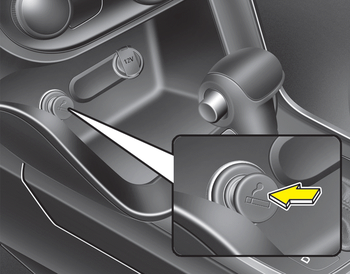 For the cigarette lighter to work, the ignition switch must be in the ACC position or the ON position. Push the lighter all the way into the socket. When the element has heated, the lighter will pop out to the "ready" position. We recommend that you use parts for replacement from an authorized Kia dealer. Holding the lighter in after it is heated will cause it to overheat. Do not insert foreign objects into the socket of the cigarette lighter. It may damage the cigarette lighter. The use of plug-in accessories (shavers, hand-held vacuums, and coffee pots, etc.) may damage the socket or cause electrical failure.